Female Transformation Of The Week - Rachael Franklin. Rachael really didn't start having problems until she moved to New York where her diet and training suffered a great deal. She wanted to change all of that. 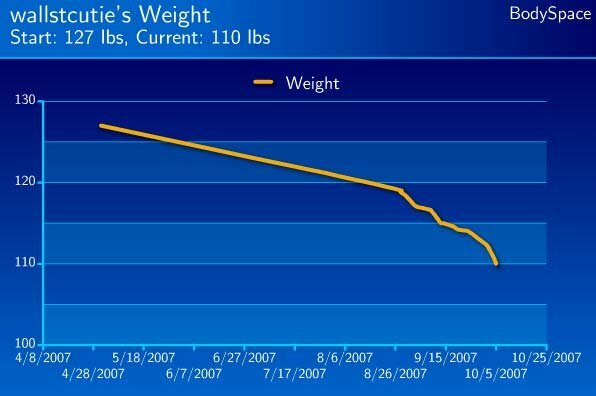 Learn how she lost 17 pounds and almost 20% body fat! I&apos;ve never had what I would consider to be a "bikini body" since I had a large body fat percentage, and my genetics built a pear-shaped body, as you can see from the before pictures; heavy on the hips. It started going downhill when my husband and I moved to New York, where my regular stops to the bagel cart on the way to my Wall Street job began to take a toll. I gained 7 pounds in 7 months, which doesn&apos;t SEEM too bad, except for the fact that I had not only gained fat but LOST a LOT of muscle tone. I didn&apos;t step into the gym for months. My suits all started to get really SNUG and I started buying a couple of new ones and started to retire the "tight" ones. 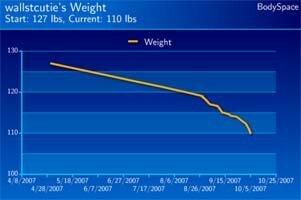 The way things were going; gaining a pound a month, in 30 months; this was going to be a scary picture! After going to the doctor for a routine checkup and weighing in at 127, with a resting heart rate over 70, I decided to make a change. I hired a trainer who started me on the right path with boot-camp type training. Doing a lot of research on my own, I read articles written by Jamie Eason and Tom Venuto, who both talked about the importance of proper nutrition to get results. Fitness America Pagent October &apos;07. Reading what these two had to say was really inspiring! After I incorporated the nutrition plan of 5-6 small meals per day; cutting out starchy carbs in the last few meals and incorporating 1-1.5 g of protein per lb body weight; the fat really started melting off. I really started enjoying this and even got inspired to train for a competition. I met with competition coach Sheri Newton of face4fitness.com. She not only reinforced what Tom Venuto had to say about nutrition, but she told me I had to start hitting the weights HARD and told me the importance of supplementation. No matter how enlightened we become, we still face the realities of life. In bodybuilding, you have your body, mind and spirit. Where does your inspiration come from? The circuit type training I had been doing with my trainer had taken me to a point, but I was not pushing my muscle to grow. So, by adopting a proper nutrition plan, plus hitting the weights HARD, I began to see sweeping changes - I have much more energy than I used to and my resting heart rate is now below 50. For snacks, I like XS protein puddings, green apples, celery, cucumbers, and almonds. Now that I&apos;ve gotten down to a lean body fat%, I intend to incorporate a cheat meal a week. I love middle eastern food and Carvel Cake Mix ice cream! Click Here For A Printable Log Of Monday - Legs And Abs. Click Here For A Printable Log Of Tuesday - Back And Shoulders. Click Here For A Printable Log Of Wednesday - Chest And Arms. Click Here For A Printable Log Of Thursday - Legs And Abs. Click Here For A Printable Log Of Friday - Chest And Back. Click Here For A Printable Log Of Saturday - Shoulders And Arms. Cardio: 45-60 minutes moderate intensity (brisk walk/run across the Brooklyn Bridge with my dog) every morning before breakfast. After competition, for maintenance, I will work each body part 1x per week, cut cardio back to 3 or 4 times per week, and add in a functional training day (plyos/sprints/kettle bells, boxing class, spin). Setting goals, writing them down, and sharing them with others will definitely put you closer to achieving them. Of course there will always be people who will try to sabotage or belittle your efforts, but you will be surprised how they will come around if they see that you are persevering. Want To Reach Your Goals Fast? Slow Down! Far too many individuals think that more effort will equal faster success. Here are two scenarios that might put you on the fast track to failure along with suggestions to succeed. Once they see the changes in you, they will be asking for your advice - believe me, I know from experience! Also, surrounding yourself with a network of positive like-minded individuals (like those on Bodybuilding.com) is essential for motivation and staying on track!